Matt is a full-time professional photographer. He initially started shooting portraits for families and gradually expanded his business to weddings and portraits to the point that he was voted “Best Photographer in Ventura County” four times in newspaper readers’ polls. C-Magazine, Brides California and Zooey magazines. In early 2012 He won the prestigious “PDN International Top Knots” competition. 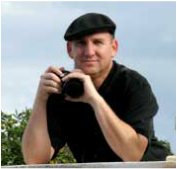 Robert is a professional photographer from the Thousand Oaks area specializing in fine art photography covering a wide genre of European and international cultures. His work includes portraiture, landscaping and wildlife and custom assignment work for individuals, designers and businesses. Roberts works are displayed around the world and are available on his website and at selected art shows. His most recent work was shown at the Thousand Oaks art festival. When not busy travelling abroad Robert offers photographic instruction and seminars, where the benefits of his over 33 years of photographic experience are shared with others. Hutch has many years experience as an avid photographer. He was awarded "Sweepstakes Photographer" at the 2009, 2010 & 2011 Ventura County Fair as well as Best in Show in 2009 & 2011. His work has been displayed at Proverbs Coffee House in Camarillo and at the Kavli Theatre in Thousand Oaks. Visit www.digitaldaydreaming.com for more information. Greg teaches at the Brooks Institute in Ventura, California. Greg started in photography as a student at Western Kentucky University where he graduated in 1996 with a double major in both photojournalism and anthropology. After graduating he worked in Ohio for a few years as a photo editor before deciding to return to his native Ventura county. On his return to Ventura Greg pursued his Master’s Degree in Photography at Brooks Institute and graduated from there in 2004. He remained at Brooks as a teacher in their Visual Journalism Program and continues to teach there today. Keith earned his Bachelor of Arts in Commercial Photography from Brooks Institute in Santa Barbara, he attended the University of Hawaii and the University of Oregon, and has taught photography workshops at Santa Monica College and Pasadena City College . Much of Keith's current work is devoted to his passion for introducing amateur and semi-pro photographers to unique places in the southwestern and western United States where he conducts a range of workshops. His workshops are of special interest to photographers since they are often timed to occur during lunar and other natural events. Emeritus Professor of Cinema & Adjunct Professor of Art @ California State University, Northridge. Reviewers of Dr. Kuretski's exhibitions have lauded his photographs; he is represented in galleries in Los Angeles, Tulsa and Chicago. ​Born in Los Angeles, Lesley Krane earned a B.A. in Art at UCLA and an M.F.A. in Studio Art at the University of New Mexico. She has been teaching Photography in the Art Department at CSUN since 1999 and encourages students to have a reverence and sensitivity for still photography. Lesley’s work has been published in Lightleaks and The Book of Alternative Photographic Processes and exhibited at local and national venues, including the Soho Photo Gallery in New York City and the University of the Arts in Philadelphia, Pennsylvania. Ted has been a commercial photographer since 1976, beginning after graduation from the Brooks Institute in Santa Barbara. He has worked on his own, beginning with headshots for models and actors, and covering assignments that took him from the oil fields of Texas to the runways of Rodeo Drive. Ted attributes his creative vision to his years as a fashion, architectural and portrait photographer. He describes that work as ordered, structured, straightforward and usually simple and hopefully- beautiful to look at. His approach to creativity and style is guided by the idea that “there are no rules in photography ----unless you break them”. Ted has taught many community photographic classes, led workshops, and been on judging panels for various local camera clubs. His photographic philosophy is best captured with his motto: ‘Make it Beautiful. Make it Useful’. Christopher Broughton has over 30 years of extensive photographic experience working professionally with sensitized photographic materials, digital capture media and technology as a photographer, educator, lecturer and exhibitor. Christopher was educated at Oregon State University and completed both BA and MS in Photography at the Brooks Institute, where he returned later as a faculty member. Christopher quickly became a powerful influence on the famous Brooks Institute both educationally and technologically. He personally transitioned the Institute from traditional silver based technology to digital capture media and technology.